The Furnishing Committee is comprised of the MTA principal, custodial staff, teaching staff, the business manager, and PDT staff. The Committee is researching types of furniture to support an optimal learning environment. Also being reviewed is necessary cleaning equipment for the new school, the portability of furniture, and general functionality of the furniture. The Committee is gathering feedback from students and staff about potential furnishings and hopes to visit other schools that have purchased new furniture to assess the wear and tear and overall function of potential furniture choices. The goal is to pilot potential furniture options to aid the decision-making process and the plan is to gather a list of goods and prices for state review by March. We are now accepting your orders for commemorative bricks that will surround the flagpole at our brand new baseball field. Help tell your part in the history of Mt Ararat Baseball. Click here to reserve your brick now for $100 per brick. The Building Committee and the MSAD #75 School Board have approved four local artists to complete works of art for the new high school. Elizabeth Atterbury and Anna Hepler have been commissioned to create a ceramic tile mural based on Native American textile design. Lyn Dowd will construct an eagle sculpture using organic material found in the four towns of Bowdoin, Bowdoinham, Harpswell and Topsham. Richard Keen has been commissioned to paint an 8' x 8' mural for the dining commons. All artwork will be completed for a cost of $42,000 and will be placed in high visibility areas such as the learning commons, dining commons and/or entryway areas. To learn more about the Percent for Art Program, view the April 2nd Percent for Artposting here. The creation of a new baseball and multi-purpose field was one of the first visible signs that our Mt. Ararat High School project was underway. Though we had originally hoped to be playing on them next spring, a lengthy process to reconstruct utility lines as well as a very poor growing season this summer have caused us to delay that for a year. In the end, the grass did not grow to our satisfaction in time for play in the spring of 2019. Our intention has always been to have a field that is fantastic for our athletes, enjoyable for spectators, and an all around proud accomplishment of the district. We’ll need a bit more time for all of this to still come true. Similar to other sports, our Athletics Department will make arrangements for baseball practice and games at other area facilities for the 2019 season. We have wonderful neighbors who are willing to partner with us and enable our athletes to have great experiences in the interim. We have a number of dedicated parents, staff and community members committed to having an excellent athletic field when it’s done. We thank them for their ideas, hours, and contributions. As a result, our students will soon have a wonderful set of new fields to play on. A construction project this large requires the involvement of many individuals. In regard to oversight, representation from the District (Interim Superintendent, Business Manager, Facilities Director, and the Building Committee Chairperson), PDT (the architectural firm), Arthur C. Dudley (the General Contractor), the Maine Department of Education, and the Clerk of the Works (hired by the Architect to be onsite daily) meets twice each month to review progress, discuss next steps, and address questions and/or concerns. In addition, the District’s team meets every other week with representatives from PDT as well as the Clerk of the Works. Beyond the daily duties of the Clerk of the Works, regular visits from the Maine Department of Education, and daily visits of the Facilities Director, multiple engineering firms are also responsible for ongoing field testing. Recently, S.W. Cole Engineering has been providing on-site testing of soil and ground materials, and R.W. Gillespie has been providing testing of the concrete. In the future, mechanical and structural testing will occur as the building begins to rise up from the ground. All together, each step in the project is monitored for quality assurance and adherence to the specifications. As many of you are aware, the high school construction project is underway. Exciting! A great deal of work has been done since school ended in June. The contractors have been focused on site development throughout the summer with the roadway a priority, preparing all the ground systems such as water and power, drilling geothermal wells, and pouring the foundation for the new school. The progress made has been amazing! If you haven’t been on campus, you will be stunned. Our main entry road, Eagle’s Way, has been closed for the summer, but has reopened. Roadways, parking, and walking paths are all impacted by construction and construction equipment is very much a presence on our campus. For the next few years, anyone visiting our campus should plan additional time for travel, be very cautious around construction vehicles, and avoid parking on the roadways during work hours. 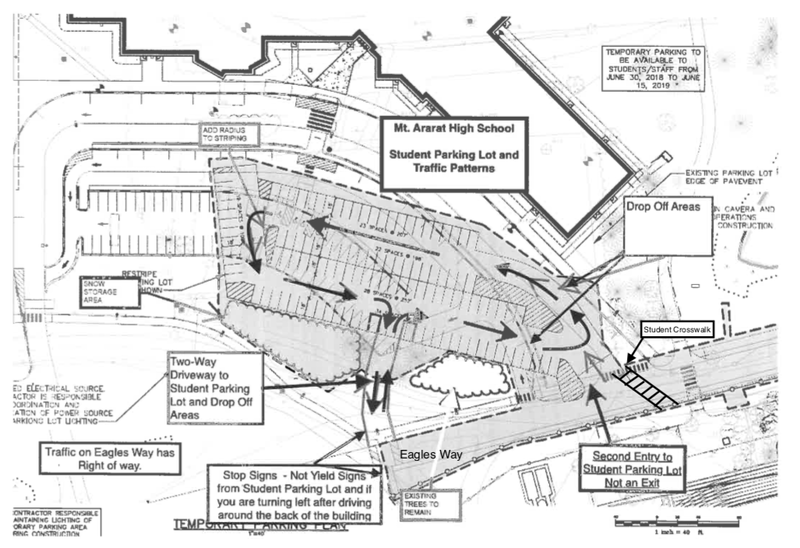 ➢ Student Parking: The student parking lot at the front of the high school has re-opened, but there are fewer spaces. Other parking spaces around the building and on campus have been designated for student parking. When students complete the application process for parking they will be assigned to park in a specific area. For students who are assigned spaces around the building, student parking is designated with painted orange lines. Staff parking spaces are lined with white paint. Please contact the Student Affairs Office if you have questions. ➢ Drop-Off Area: The drop-off area for parents or whoever may be dropping off a student for school will continue to be in the student parking lot near the crosswalk. The entry to the student parking area will be near the crosswalk, and people will be able to pull into the student parking area, drop off students, and loop through the parking lot to exit right by way of a temporary gravel access drive onto Eagles Way when leaving the parking lot. The fall athletic programs have started and many are playing at sites in our community while construction is underway. Boys and girls soccer teams will play home contests at the Riverside Field in Topsham. Football home games will be played at the Fairgrounds field in Topsham and field hockey teams will be sharing the middle level field. Please contact Athletic Director Geoff Godo for more information. And finally, if you want to follow the MTA Construction project online, there is a link on district and school websites with additional information which includes some drone footage. Monthly updates are posted by the Communications Committee based on the work of the Building Committee. Fundraising has also been a focus for the project; and if you are interested in contributing funds to support the project, information about various fundraising initiatives will be posted on this site as well. Construction of the new Mt. Ararat High School is now under way. On May 31, 2018 the MSAD No. 75 Board of Directors approved entering into a construction contract with Arthur C. Dudley, Contractor/Builder, at a cost of $46,258,682. This action followed a public bid opening for the project held on May 23, 2018, and a recommendation to approve the contract with Arthur Dudley from the Building Committee. With the current building boom some school districts are seeing the low bids for their construction projects come in significantly over budget. While Arthur Dudley submitted the only bid for the Mt. Ararat Project, the bid came in on budget and the District will be able to move forward in constructing a school with those features which were viewed as important to the school community, such as placing additional security cameras around the site, upgrading athletic facilities, creating additional classroom space and integrating energy-efficient features throughout the school. The project will also have a positive impact on the local economy, since Crooker Construction of Topsham will be providing the site work and constructing the rectangular turf field. Construction began prior to the end of the school year with work taking place on new portions of the access road. The current access road will be closed for construction this summer beginning June 25th, with vehicles only able to access the High School via Can-Am/Republic Avenue. By mid-summer foundations will be poured, beginning with the gymnasium end of the building on the current baseball field next to the Transportation Garage. On June 7th 100 community members attended a joyful ground-breaking ceremony, with speakers noting the long road for state approval of the Project over many years, and the dedication of so many individuals across the community, including PDT Architects, in reaching this point in the Project. All of this is only possible because of the incredible support from the four communities of MSAD No. 75. Stay tuned for regular updates on the progress of construction on this website. This is The Forum for cultivating student thought and learning, full of discussion and debate. This is the The Forum brimming with creative activities and shows all year. An appreciation and understanding of, and participation in both learning and in performing arts ... drama, music, and dance....in our schools and communities. For students of all ages, the forum provides a diverse, meaningful opportunity for student growth and success and promotes a community of fluent learners, critical thinkers and creative contributors to our society. The Forum provides a cultural beacon in the region, inviting the community at large to experience fine live performances, both amateur and professional. When you‘TAKE the BEST SEAT in the HOUSE, you support our mission and are a part of the action. Or, buy a plaque as a gift for someone else- your parents or child, a favorite teacher, a friend, or someone you admire in the community. 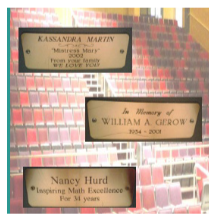 An engraved brass plaque could be the perfect gift for a birthday or anniversary, or some cherished event. The Forum has 250 seats so there are plenty of opportunities to take the best seat in the house.